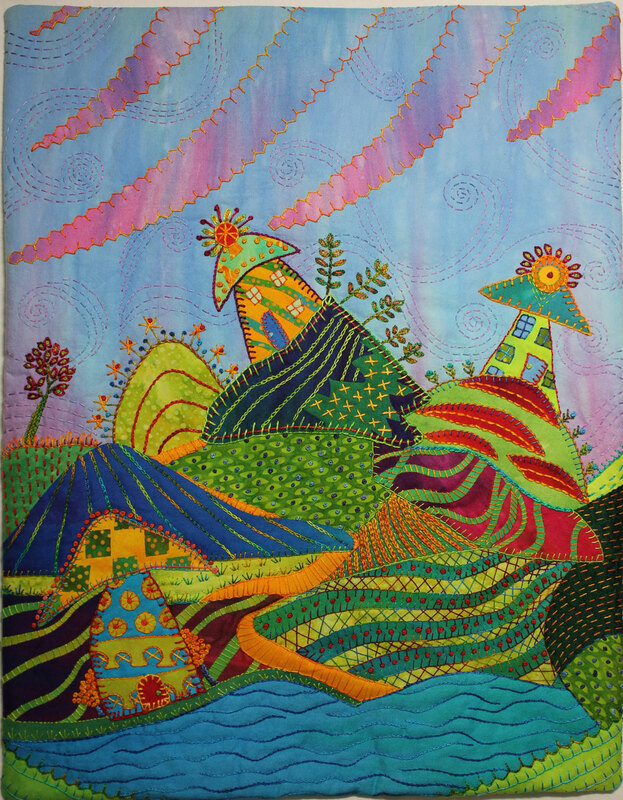 Laura’s art quilts are constructed with fusible web (a heat activated glue), her own hand-dyed cotton and silk fabrics, occasionally batik fabrics, cotton or wool batting, cotton backing fabrics, and stitched with cotton or rayon thread. Quilts are for display only and are not to be washed or laundered. To clean a quilt, carefully vacuum the quilt surface or shake off the dust. Do not expose the quilt to direct sunlight. Do not handle the quilt more than necessary. Larger quilts have a horizontal hanging sleeve sewn to the back of the quilt for a metal rod or wooden lath that can be attached to the wall. Smaller quilts may have a similar rod pocket or a hanging loop for a picture hanger. Other options are to display your smaller quilts in a shadow box frame (make sure the glass does not touch the fabric) or stitch them on to Plexiglas.